The serve in volleyball is the ultimate offensive weapon in this sport because you alone control the outcome of this skill. Become an aggressive server and you can score points by yourself for your team from the service line. Here's a ten-step checklist you can follow to increase your serving efficiency and drastically impact your point scoring ability which increases the contributions you make to your squad. Place your right foot behind your left so your right foot is perpendicular to your left and both feet are four (4) to five (5) inches apart. Make this a comfortable, balanced stance so you do not feel like falling over. Point your left foot in the exact direction you want to serve. Point your left foot, hips, and upper body straight ahead if you want to serve down the line. Turn your left foot, hips, and upper body facing cross court if serving there. Face your target when performing the float serve. Show everybody in the gym where you intend to serve your floater. 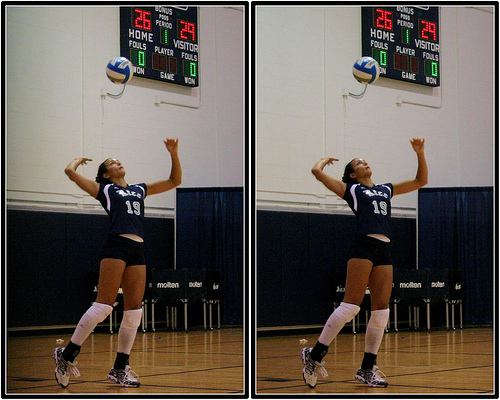 Pointing to one spot and serving another rarely "fakes out" the opposing serve receive players. You will always be off-balance, increasing your chances of serving out. Place your front foot, hips, shoulders, and tossed ball in the direction you plan to serve. You can create more force and velocity when all your energy is going in one direction (which is ball speed in this case) than when different body parts are going in different directions. Put all your body weight on your back foot before the toss. Serving requires only a small amount of lower body movement after you toss the ball. Shift your body weight from your back foot to the front foot once you've tossed the ball. Although this movement doesn't seem like much, when it's combined with your arm swing, it's enough to give the ball the momentum needed to get over the net. Toss the ball with an open-palmed left hand two (2) feet above your head and one (1) foot in front of your front foot. This magical combination of "two feet up and one foot in front" keeps your body balanced so you only have to transfer weight from your back foot to your front foot, quicken your arm swing, and make solid contact with the ball's middle panels. 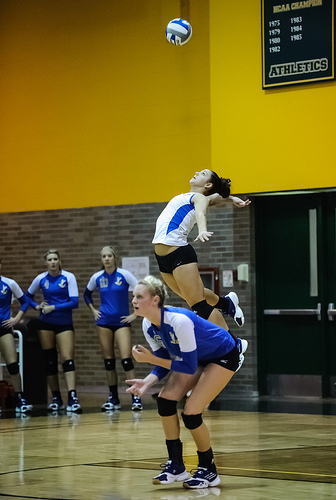 Keep your elbow high, above the level of your ear, when performing your serving armswing. This increases the chances of getting the ball over the nine-foot net when you pull or draw your arm back to float serve. 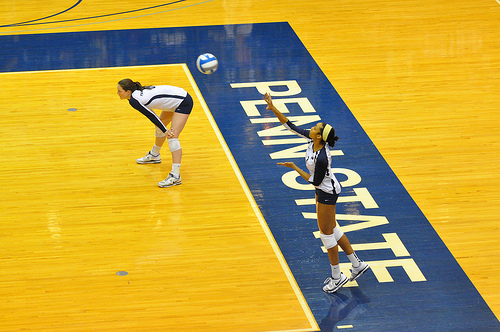 Toss the ball the same way every time you serve. Create a ritual you perform each time you serve so you don't rush your serve. That could be bouncing the ball three times in a row, then taking a breath, and pointing your foot in the direction you want to serve before serving. Work it out so you do the same thing every time, whatever it is. Create a ritual you perform each time you serve so you don't rush your serve. Eight seconds is a long time. 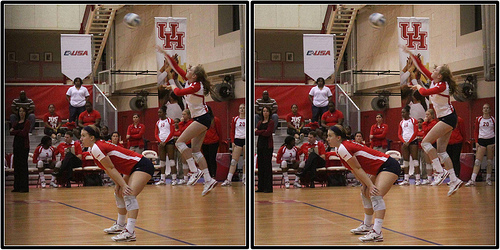 You have eight seconds to complete your serve in volleyball routine and get back in the court. Remember this is the only time that you completely control the game. Maintain control by taking your time and being completely aware of everything you plan to do before you serve the ball. You can learn more about Serving by visiting the related links below.